Our individual love for cars manifests itself within us in a countless number of ways. It's as though we each find our way to a common place by a path all our own. Some are raised wrenching under a car along side their old man, busting knuckles on tools their fathers and grandfathers used as well. Others find their own way, perhaps inspired by the first cool car they saw pass the school bus we all rode as a kid. Everyone's story is entirely unique, taking them down a path that slowly converges into another, and another, until niches in the car community are formed. 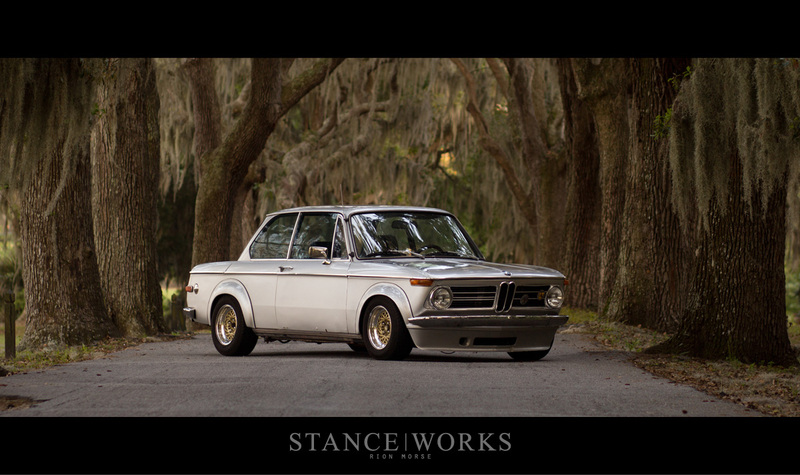 Patrick Burns's story brings him here: to help expand the borders that define STANCE|WORKS and the cars that make our gears turn. Patrick's story doesn't begin with this '72 Polaris Silver round-tail; it begins much, much earlier. Patrick grew up with his old man, known around town for being a car guy. Since he can remember, he's been part of an automotive family, spending afternoons in his father's detailing shop which often housed high-end P-cars and F-cars. But it only makes sense that if the car his mother drove while pregnant was a 5-speed 320is that Patrick would eventually become a BMW guy. Unfortunately, the key word would be "eventually." 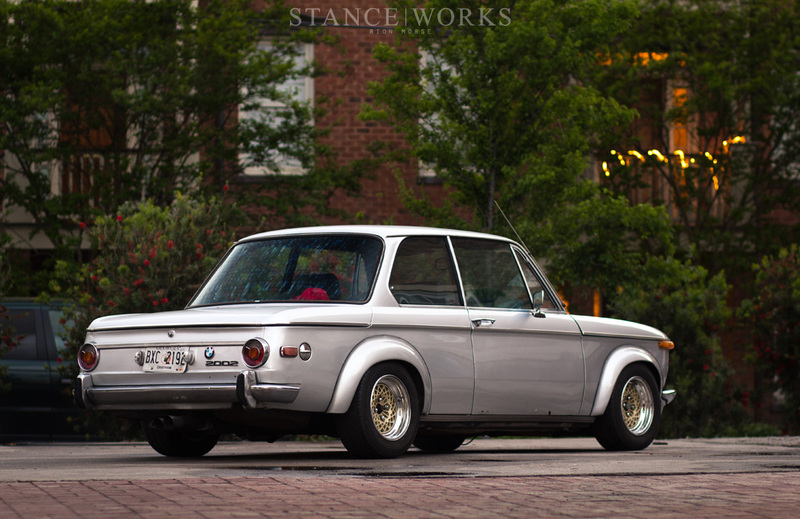 A bit over 10 years ago, Patrick hit the jackpot: his first car was a euro-spec M30B34 swapped E9, a dream-car for any BMW enthusiast. As one of the most iconic cars BMW has ever built paired with a purist-approved power plant to give it some modern "oomph", it was a car many would hold on to forever. Patrick, on the other hand, sold the car off to a Microsoft executive so he could fund the purchase of his second car, a '97 Honda Prelude. 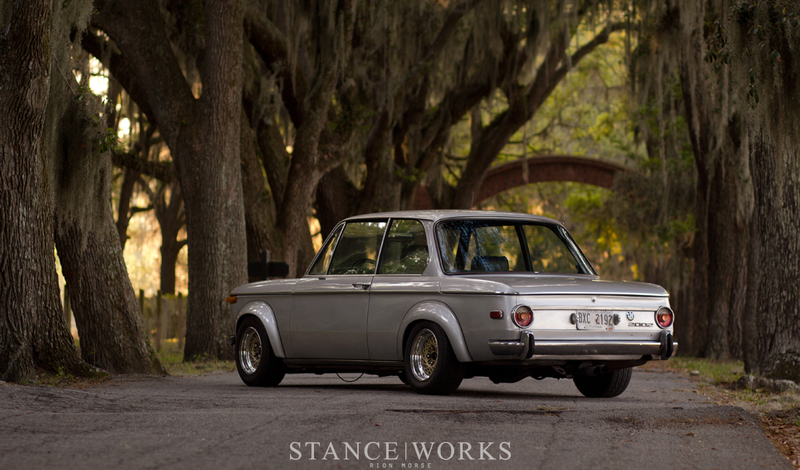 "It was probably the biggest mistake in my automotive life. My buddies Griffin and Ruben always remind me of it. I blame it on the JDM movement going on in the late 90s." Oh, the pain of adolescence. 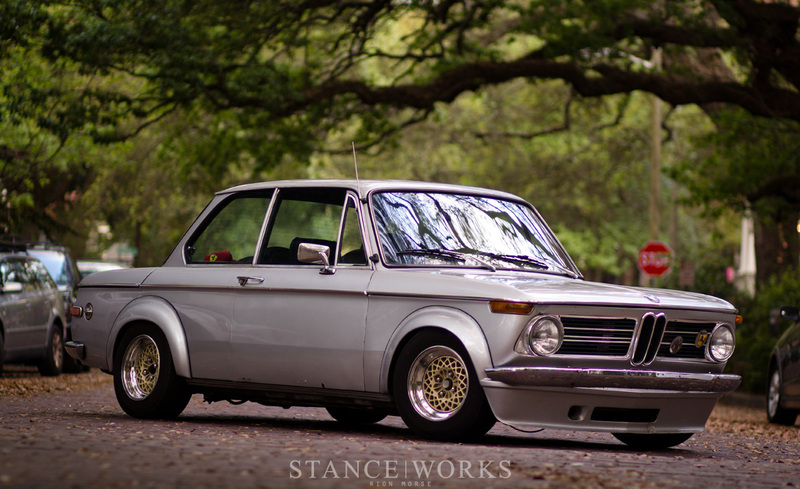 Fortunately, Patrick came around and has since owned several 2002s, E30s, and even a few M-badged cars. Most recently was an E30, a car I know he took some pride in. However, he was having a bit of an affair. Patrick was eyeing this particular 2002 for quite some time. He had asked the owner, Rob Parker, a builder and racer of 2002s and old Porsches, to sell it, but his answer was always the same. Eventually he relented and sold the car, however, it wasn't to Patrick. Instead, he sold it to his brother's step-son, perhaps gone from Patrick's sights forever. Luckily, he received a phone call one day from 'ol dad saying he spotted the car for sale back at Rob Parker's shop. 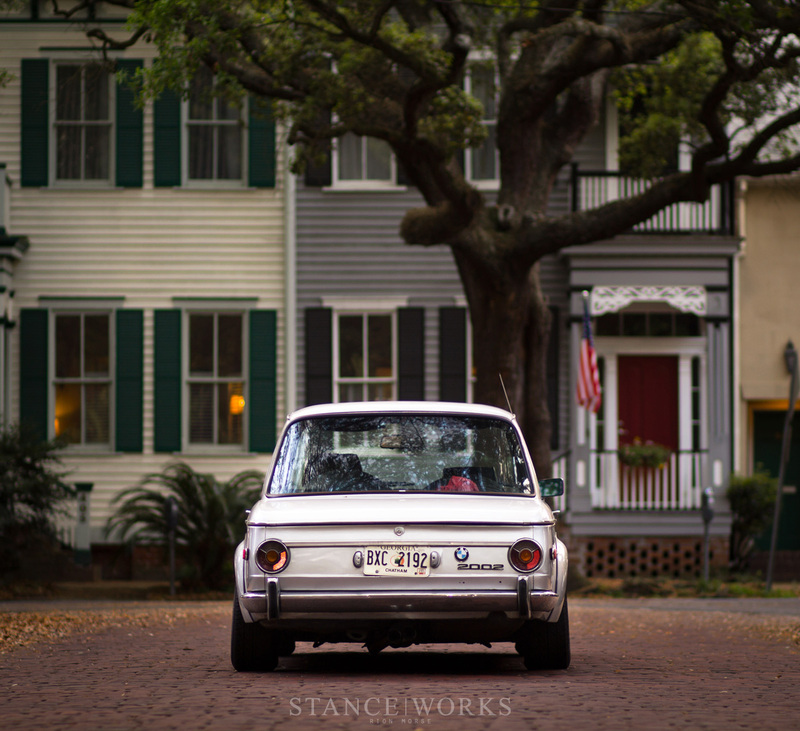 Patrick hustled to sell the E30 and one week later, the '02 was his. Tidbits of rust linger throughout the pits and pockets of the car, notorious for such issues, but it was hardly enough to scare Patrick off. "I anticipate a full restoration in the future." Until then, the go-fast parts will have to hold him over. It still has the classic M10 under the hood but the driveline is far from stock. The head of the engine was replaced with a larger 2.0 head from a late model '02, and the transmission was swapped out for an E21 5-speed. A 3.91 LSD in the back adds for some seriously spirited driving. Headers and an ANSA exhaust allow the car to breathe a bit better, and in the name of hitting the corners, the car sports a combination of Bilstein, Ground Control, and ST suspension goodies. And more is in the works... The entire front structure of the car was cut out to accomodate a much larger Porsche 944 radiator. An oil cooler has already been routed and a turbo build is on the way. For the wheels, Patrick scored a set of 13x7 Ronal Racing mesh splits, a wheel-guy's dream-come-true. Torn on the decision of whether to go with the tried-and-true BBS RS or the Ronals, there's no doubt that he made the right call. 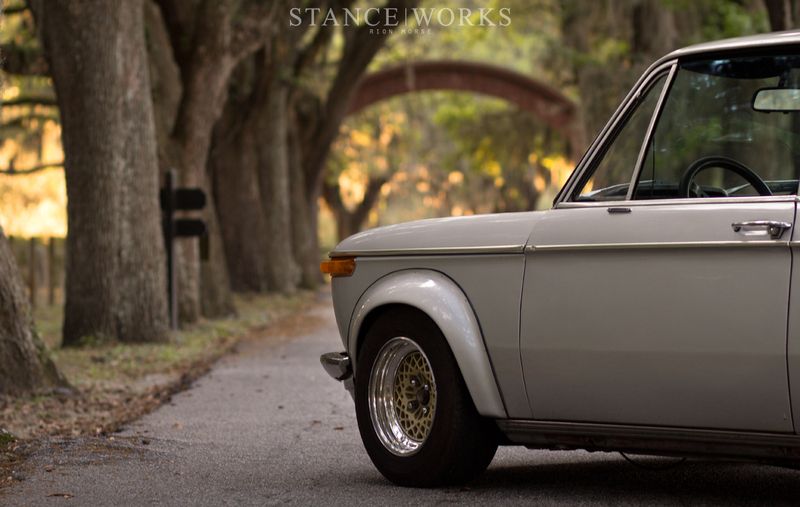 The nice and beefy 205/60 radials give it a classic stance that both old men and youngsters alike can appreciate. It's a style that harks to the glory days of the 2002, with the large turbo flares giving the car a defined presence among other cars of the era. Tidbits such as the Euro H4 flat Hellas and the 350mm Momo Prototipo steering wheel only add to the overall package. One can only hope Patrick holds on to the car for a while and sees things through on a full restoration. "I am easily bored, so I switch cars often. Just ask my wife and friends." I'm thinking there's a chance it'll happen though. 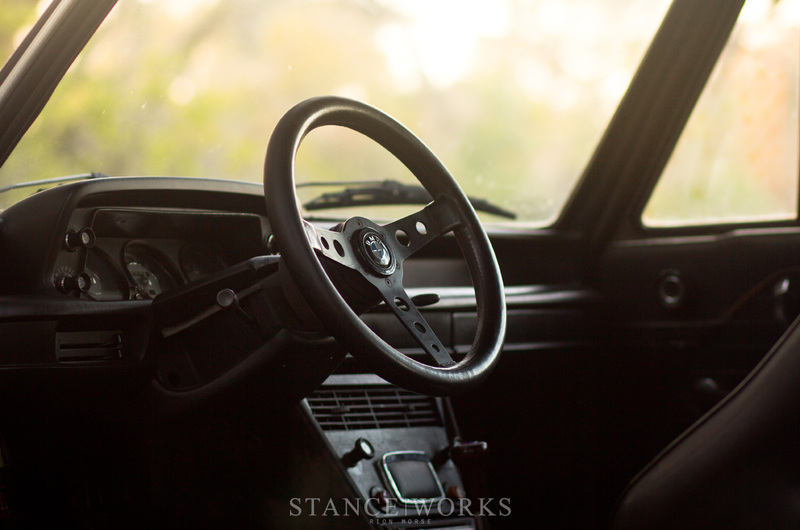 "There is nothing in the world that is better than hearing a 2002 or older Porsche door close. You know that sound!" Patrick said to me as he explained his love for the 2002. From the simple thud of the old German steel doors closing, to the historic and race-inspired lineage of the car itself, Patrick knows it's a bit of a match made in heaven. 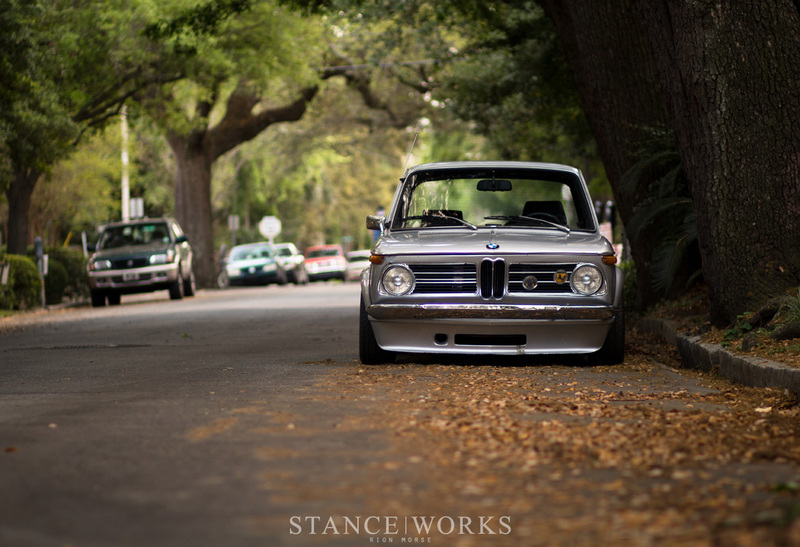 As our community continues to grow, more and more people find themselves snagging cars from a past generation. Some for the cheap, used, and abused nature of the cars owners have began to neglect, and some for the history each car has to share. In the latter lies Patrick, building his car for no one but himself, yet celebrating and promoting a community that he has both influenced and pulled influence from. After all, we're here for more than stretched tires and wheel fitment; we're here for cars with a story. And thank you to Ethan Watson for the video! Patrick Burns 2002 from Ethan Watson on Vimeo. I would like to give thanks to my wife who tolerated my passion for cars, my father for introducing me to the automotive world, Levent (Guten Parts) and Steve (Blunt) and my Savannah car crew. We would definitely not have made it this far without the Savannah guys. “The entire front structure of the car was cut out to accomodate a much larger Porsche 944 radiator.” Why do people do this? My cars don’t overheat in Southwest USA.